Claudia has an infectious and quirky way of making artworks tell their tales in a uniquely engaging way. After graduating with a MA in Modern, Medieval, Early Christian and Byzantine History of Art from Ludwig-Maximilians-University in Munich, Germany, Claudia moved to NYC, where she lectured at the Solomon R. Guggenheim Museum and worked in MoMA’s Education Department, creating programs for the blind and visually impaired as well as improving children’s cognitive skills through art. 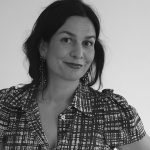 Claudia is a visiting lecturer at the Corporate State University Baden-Württemberg, Germany, where she runs workshops and teaches on Art, Business & Creativity and has also spent 20 years as a journalist in Milan, providing arts content for the likes of Vogue, Elle and Architectural Digest. In 2013 Claudia moved to London and now lectures at Tate Modern, Tate Britain, V&A, London Design Museum and gives public tours at the National Gallery.